Balancing work with some playful activities works wonderfully well for employees and employers. It is not just a way of de-stressing but also a creative way to become a stronger and healthier group. 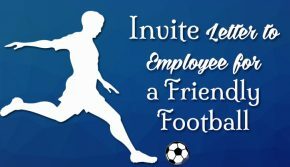 As a company, if you are planning to organize a cricket match or a football match amongst the employees of you organization then you must send a friendly invite to them inviting them for a fun-filled match. Such invitation letters are quite simple and also very short. So if you have to frame this kind of an invitation letter for a friendly match, use the sample template for your reference to invite the employees and also their families for this event. We would also like to inform you to bring your spouse and children along for this friendly match to enjoy the sports activity followed by lunch to celebrate Republic Day with vigor and high spirits. Employee get together is an official meeting which can be held monthly, quarterly, half yearly or annually depending on the company’s requirement. For any company to be successful, team building is a must. That’s the reason companies organize team lunch, dinner parties, cricket, holidays etc. to bring the team closer. Awesome blog! Do you have any tips for aspiring writers? I’m hoping to start my own site soon but I’m a little lost on everything. Would you propose starting with a free platform like WordPress or go for a paid option? There are so many choices out there that I’m totally overwhelmed .. Any suggestions? Many thanks!